← Journal It Out: I did! Sometime, doing something different – something out of your comfort zone – is just what you need to get your mojo going. My head has been filled with all sorts of emotions lately. This big business decision I needed to make (more on that in a sec) and friends/family going through some rough times – really personal things that kept me in a bit of a fog. Then Robin Williams died. It’s interesting the impact this celebrity’s death had on me – and on most of my friends. After all, I didn’t “know” him, right? He was just a few years older than me, so I’ve been laughing at/with him for FORTY years! I remember watching that Happy Days episode where he first appeared. Then Mork and Mindy, of course. And how many times did we watch as his genius brain entertained us with non-stop brilliant monologues? So many times we laughed so hard we actually cried. I know I’m not alone in thinking he just might have been the funniest man on the planet. And Good Morning, Vietnam and Goodwill Hunting showed he had great skill as a dramatic actor as well. To learn that his own depression was so deep he couldn’t work his way out is, well … heart-breaking and I just haven’t been able to stop thinking about it. And then watching what has happened in Ferguson, Missourii and thinking about what’s happened to my country in general and how we are giving more and more rights to corporations while taking away more and more rights from individuals. And what’s going on in the Middle East and …. I know, heavy right?? 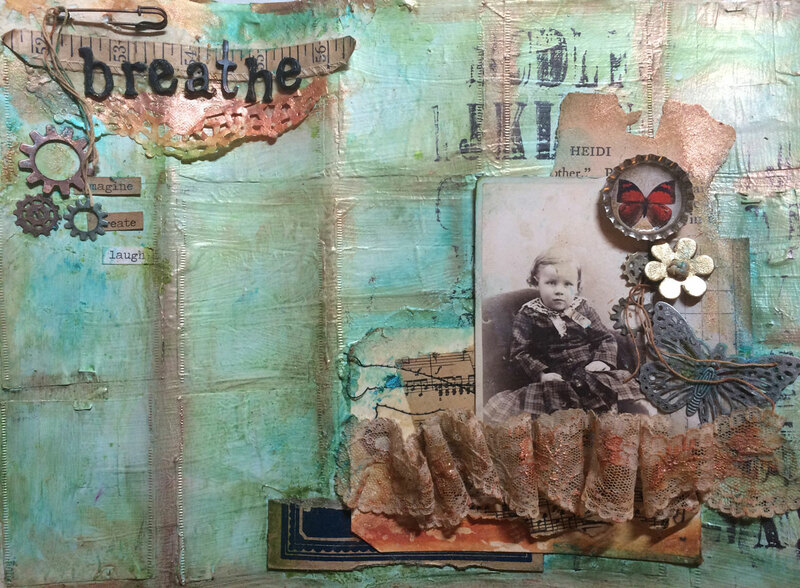 So, when I saw that the Life Book 2014 lesson for the week was by Finnabair (Anna Dabrowska) – an extraordinary mixed media artist whom I adore – well it was just what I needed! I’ve never done a full-on mixed media piece before, so I was very excited about it. Now, I’m not going to lie and tell you that this project was without it’s challenges – if you know me at all, you know my art adventures are always just that. But I think for a first attempt it came out great and I’m definitely going to try more in this style. Oh! Forgot to tell you something about my mixed media piece! When my husband came back from golf yesterday, I’d just finished uploading the pictures I’d taken of the project. I was telling him all about it, and he’s looking at it very intently. Then he says, with all seriousness … wait for it …. “Where’d you get those little egg rolls and how did you get them to stick on there?” Sigh. Egg rolls? LOL That’s funny! I suffer with major depression, myself, so, hearing about Robin Williams really made me feel for him. People think that depressed people just decide one day to take their own lives and do it. It isn’t always like that. They/We suffer, silently, for days, months, or longer. We put on a cheery face ’cause who wants to hear a bunch of sad people. Not only that, but, often, talking about it just aggravates the feelings. Depression has no outward signs either, unlike MS or Paralysis or even a broken leg. I keep to myself, rarely leaving my home. It’s surprising what someone will do in the name of self-preservation! I bet I know where you are going, too! I was right on Amber’s new ‘shop’. I love ya for being yourself. Thanks for that! Su -just saw your comment. Depression is such a terrine, debilitating decease. My heart hurts for you. I’m thinking about you, girl! Hugs! P.S. I bet you were right about my new shop. You’re one smart lady! Thank you, Vicki! That means a lot to me. Thanks for your nice words, girlfriend. Sending you a FB message. LOVE your mixed me art piece and I am very excited about your new business opportunity! Thanks so much! I’m excited too! Art Journal Pages – Do They Have a Purpose?